I missed the farmers’ market last Saturday. Instead, the morning found me traipsing around the city with a weekend bag full of sweatpants and vegetables, a backpack full of library books, and a giant platter from Murray’s Cheese. The schlep was well worth it, as it meant having the opportunity to attend a workshop with the luminous Sarah Owens, who just won a James Beard Award for her new book, Sourdough. After class, I headed up to Grand Central to hop the train to Cold Spring. Beth was out of town for a few days and had graciously offered up her lovely home as a writer’s retreat. I was bound and determined to finish up my final paper of the semester. Things got off to a slow start, owing to exhaustion and, possibly, the basil gin and tonic I whipped up with herbs from Beth’s kitchen garden. …and Oscar, who apparently likes cheese as much as I do. By Monday afternoon I had a serviceable first draft and was headed back to the city. I spent Tuesday fine tuning my paper and was back at work Wednesday morning with a worrisome twinge in my lower back. By Friday the pain was hard to ignore. I knocked off early and headed to the acupuncturist. Sixteen needles and seven small and rather tortuous cups later, my back was starting to release. Steve slapped a couple of giant stickers that smell like a combination of tea tree oil and Bengay on and sent me on my way with instructions for gentle stretching and heat. And so last night was an uncharacteristically low-key one. I met Sari for a lovely and light early dinner and spent the remainder of the night getting intimate with my heating pad. This morning found me back at the farmers’ market loading my bag with more goodies than someone with a bad back should reasonably carry. I returned home to a breakfast of ibuprofen and an egg sandwich. Bring a small cast iron (or nonstick) skillet up to medium-low heat with the butter. Add the anchovies and smash with the back of a spoon until they begin to dissolve into the butter. Add the red pepper flakes. Finely mince the bulbs of the ramps and add these. Sauté, stirring frequently, until soft. Roughly chop the ramp greens and add these plus some black pepper. After a minute or two, you should have a coarse paste. Take off the heat and fold in the lemon zest. Slather onto both sides of a halved and toasted roll. Fry an egg over easy in the lingering ramp butter and layer it onto your sandwich. Top with arugula and the other half of your roll. This sandwich is best enjoyed from the comfort of your heating pad. We are finally, officially sprung. What should have been a weekend of paper writing turned into several long walks, a couple of impromptu movie dates, and pretty much the prettiest, most delicious cocktail that you ever did have. Ladies and gentlemen, I present the Casa Rosada—a heady concoction of reposado tequila, Campari, coconut, lime, pepper tincture, and salt. Just typing this makes me contemplate hiking over to Grand Army Bar right now. But, then, I would have to get dressed. Set a pot of water to boil with a hefty pinch of salt. Bring a medium-sized skillet up to medium-low heat with the butter and olive oil. Add the asparagus, starting with the stalks. Stir regularly. After a couple of minutes, add the asparagus tips and the whites and stems of the ramps. Cook for another couple of minutes, stirring regularly. When the water boils, add the linguine to the pot. Meanwhile, back in your pan, add the ramp leaves as well as the lovage and continue to stir frequently. Give your veggies a good dose of salt and pepper. When the linguine is just shy of done, scoop it directly into your pan along with 1/4 cup or so of the cooking water. Crank the heat up to high and stir continuously for a minute or so until the water disappears. Take off of the heat, crack the egg directly into the pan and continue to stir continuously for another minute. Add the lemon zest and juice, parmesan and more salt and pepper to taste. This makes one serving. Scale up as you see fit, but know that this is a dish best served fresh. At under 20 minutes from start to finish, why not just make it again tomorrow night? Having spent much of my week in meetings, I find myself home alone on Friday night desperately attempting to catch up on emails and a couple of writing projects. This is not as bad as it sounds when you consider the fact that I went a little overboard on the ramps during Monday’s farmers’ market expedition and had the foresight to pick up a ball of pizza dough on my way home this afternoon. It seems that Friday night pizza is officially a thing. 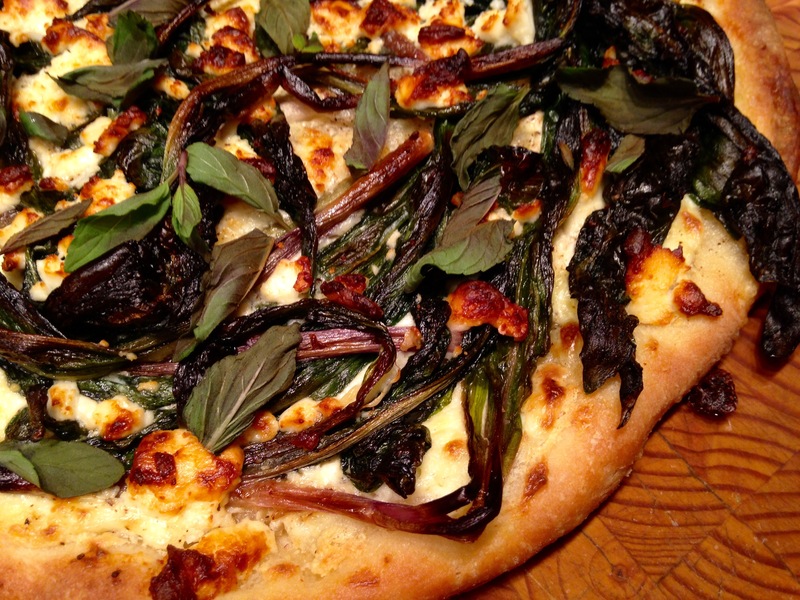 Turn your oven up as high as it will go and remove the pizza dough from the refrigerator. Bring a large cast iron skillet up to medium heat with the butter. Add the ramps, placing the bulb ends in the skillet and draping the greens, which will cook faster, off the side. When the bulbs are starting to brown, flip the ramps over, When the other side has some color, slide the greens portions in as well. Flip one more time to cook the greens thoroughly, sprinkle with a little salt and set aside. Give the skillet a quick rinse and pop it in the oven. When the oven is pre-heated, remove the skillet and swirl a little olive oil inside. Slowly stretch your dough into a circle approximately the size of your skillet by working your hands around the edges, pulling gently and allowing gravity to assist. Place the dough in the skillet, drizzle a little more olive oil on top and then spread the ricotta cheese in a layer. Add some black pepper, the ramps and the feta cheese. Pop the pan in the oven and let cook for 7 to 11 minutes until the edges of the crust are browned. Sprinkle the hot pizza with the mint leaves before serving. This should probably be enough for two people, but I’m having a hard time resisting the half that’s sitting on my cutting board. While en papilotte sounds fancy, it’s actually a great trick for crafting a quick and delicious meal for one (or more) with minimal mess. 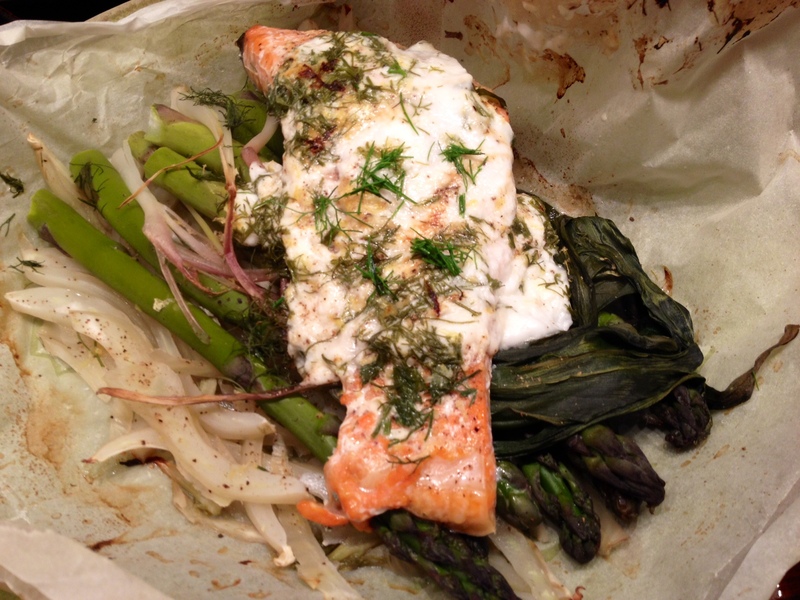 All you need is some parchment paper or, in a pinch, aluminum foil. Not being much of a baker, I’ve had the same box of parchment sitting in a kitchen drawer for years, ready for deployment on nights like tonight. I spent the first half of my Monday frantically pulling together materials in preparation for an evening board meeting that was ultimately canceled. And so I find myself with an unexpectedly free night and a serious desire for solitude. 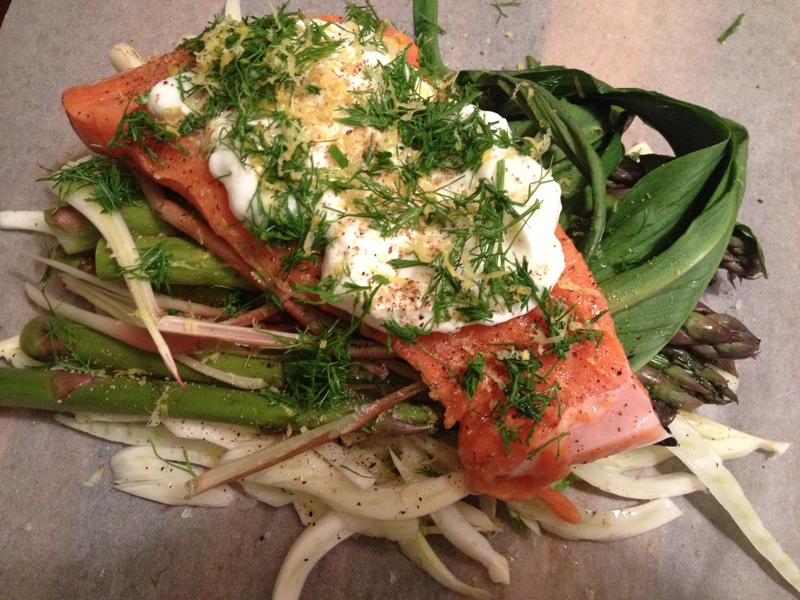 On the way home I picked up a piece of salmon and some asparagus (hallelujah for green vegetables) to go with the ramps and fennel waiting in my refrigerator. Pop a large cast iron skillet (or a baking sheet or dish of some sort) into the oven and set it to 400. Turn on the radio, strip off your work drag, pop open that bottle of Orvieto left by a dinner guest with excellent taste and pour yourself a glass. 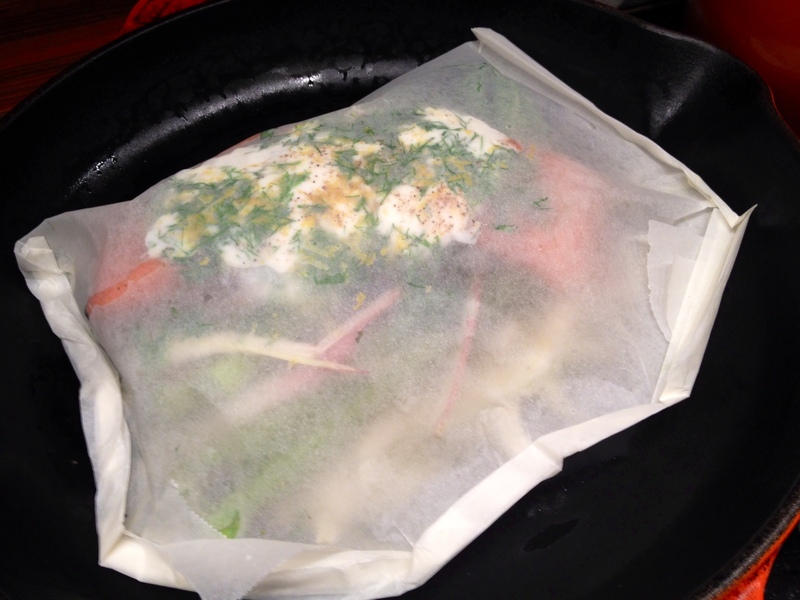 Lay a large piece of parchment on the kitchen counter. Rinse the fennel and then remove the stalks, reserving and finely chopping the fronds. Halve the bulb, core one half and then slice it as thinly as possible. Toss the sliced fennel onto one half of your parchment and pop the unsliced half into the fridge for a future use. Snap the woody ends off of the asparagus and layer the stalks on top of the fennel. Rinse the ramps, trim off the very tip, slice them in half lengthwise and lay them on top of the asparagus. Sprinkle with salt, pepper and lemon zest. While pouring yourself a second glass of wine, give the vegetables a little splash. Rinse the salmon, feeling for and removing any remaining bones, and pat dry. Place the fish on top of the vegetables and add more salt, pepper and lemon zest. Spoon the yogurt on top and garnish with the fennel fronds and more lemon zest. Fold the parchment in half and begin folding the two halves together, making tight creases with your thumbnail as you would origami, until you are satisfied that it is reasonably airtight. Set this in the oven in your preheated pan and go about your business. After 17 minutes, pull the pan out of the oven. If you did a good job of folding, the paper will have puffed up. Tear this open like you would a present at your fifth birthday party and behold your dinner, swathed in headily scented steam. This is a comically simple but deeply satisfying dish. At the end of it all, you are left with a cutting board to wipe down; a chef’s knife, microplane, dinner plate, knife, fork and spoon to wash; and another glass of wine to pour. Can somebody please remind me of this the next time I decide to host a dinner party for eight? Well that was a long week. I saw visiting family off on Monday, delivered a performance/presentation in class on Tuesday, had major dental work on Wednesday, and turned in my final paper of the semester on Thursday–all while holding down my full-time job. I had high hopes of attending an event tonight, but exhaustion and misanthropy got the better of me. I did manage to swing by the Union Square Greenmarket on the way home. Agricultural reality continues to lag behind our culinary aspirations, but I was able to pick up more ramps and broccoli rabe, along with a couple of Bread Alone’s multigrain panini. I got off the mercifully uncrowded Q train at 7th Avenue and swung by Mermaid’s Garden, the newish fish shop in my neighborhood I’d been meaning to check out for months. 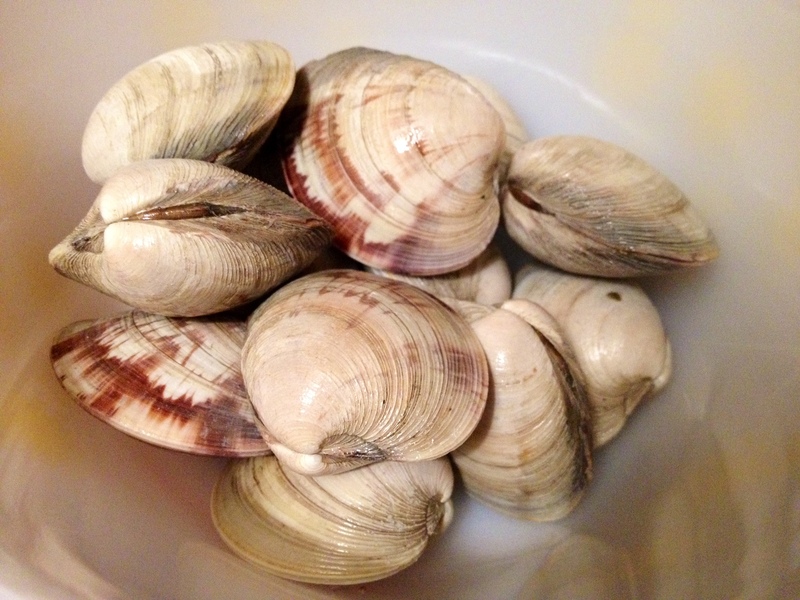 I picked up a dozen littleneck clams, which I somehow thought would pair well with broccoli rabe, and a couple of pounds of Georgia shrimp, which went into the freezer for some future delight. Drop the clams into a small bowl, top with water, and fix yourself a cocktail. Once you have finished your cocktail, fill a medium pot halfway with water, add a healthy pinch of salt, pop a lid on, and set it over high heat. While the water comes to a boil, fix yourself another cocktail. Roughly chop the broccoli rabe, toss it into the pot, and boil for two minutes or so until just softened but still toothsome. Strain into a colander and run some cold water over the top to stop the cooking process. Place the pot back on the burner, lower the heat to medium-low and toss in the bacon. Cook, stirring frequently, until the bacon has rendered. Chop the ramps and the green portion of the scallions and add these plus the red pepper flakes to your bacon. Cook for a few minutes. Crank the heat up to high and add some of that white wine that was questionably drinkable when you first opened it and is most definitely not drinkable after a month in the fridge. Fish the clams out of the water and drop them into the pot. Let boil, stirring a bit, until the clams start popping open (approximately five minutes). As they open, pull them to the top so as not to overcook. Thinly slice the whites of the scallions. 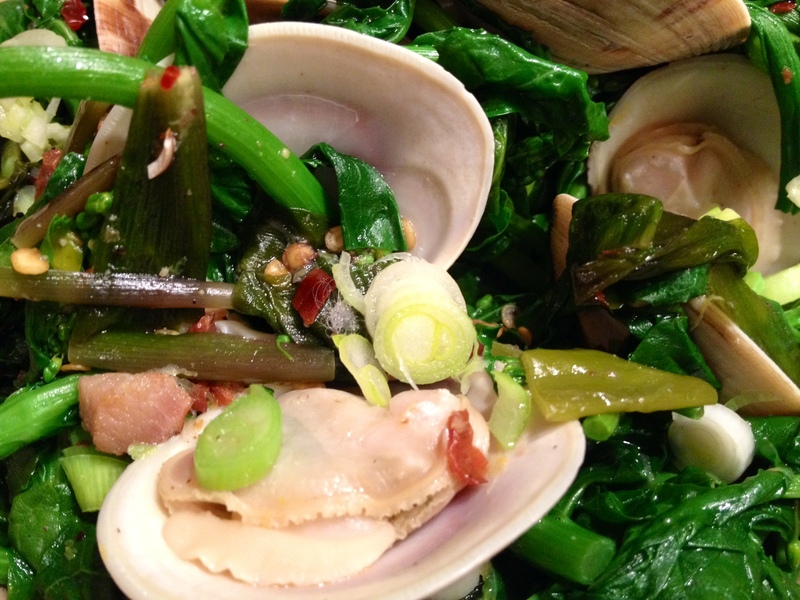 When the clams have all opened, turn off the heat and stir in the blanched broccoli rabe along with the lemon zest and salt and pepper to taste. Dump this into a bowl and serve with some good quality bread to soak up the juices. A spoon might be helpful. But, if you happen to be dining alone, just lift the bowl up to your face. The cat will not be offended.